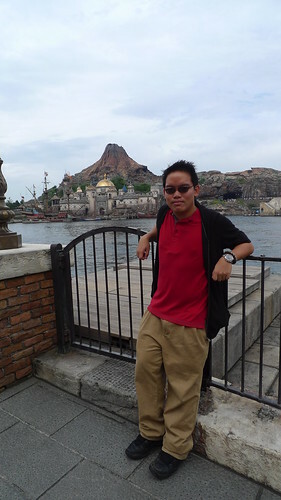 I had slightly more than 2 hours of sleep before I woke up at 5:30 in the morning and prepared for my first ever trip to Tokyo DisneySea. - The original Disneyland. I went there the first time in 1991, I was 7, visited the place a few times since then, but haven't been there since 1998. - Walt Disney World in Florida. Went there in 1993, I was 9, dad had a conference in Miami, so it was only me and mom in Orlando, so for she got us a 4-day pass to Disney World, one day in the Magic Kingdom, one day in the Epcot Center, and 2 days at my favourite, the Disney's Hollywood Studios, back then it was known as the Disney-MGM Studios. 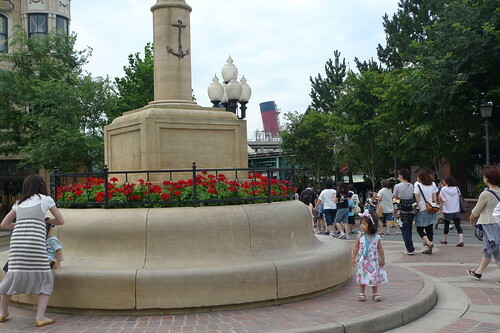 - Disneyland Paris. Last visited in 1996. I remember living in the Disneyland Hotel and it was mindblowingly beautiful. 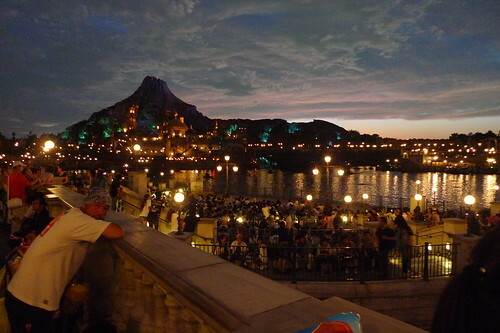 - Tokyo Disneyland. Went there a few times since I was a child, last visited in 2001. Haven't been there after I moved to Tokyo last year. Since the original Disneyland is the first Disneyland I've ever visited, it retains a special place in my heart. Walt Disney World was magical, but due to the scorching weather then, and the pain mom and I had to endure when queuing for each attraction, we realized that the theme parks are better to visit during winters. 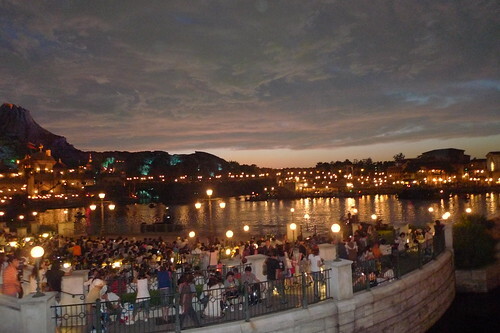 I like both Disneylands in Tokyo and Paris, but don't think they can match the original. 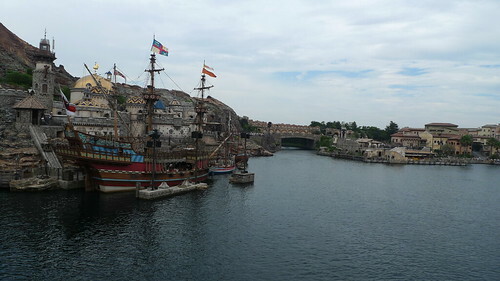 Arriving at Tokyo DisneySea around 8 in the morning with my friends Yang Yang and Zifeng (they are graduates from the Beijing Film Academy), we were supposed to meet another friend, Tou-san (also a Beijing Film Academy alumnus) and her filmmaking partner (yes, we were all filmmakers). 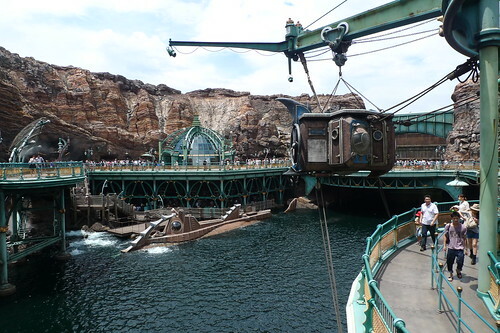 This is the DisneySea AquaSphere, a symbol of the place situated at the Entrance Park. That's where I saw Daisy Duck. Did all these people wake up as early as I did? Like most first-time visitors, I was definitely in awe. Already, I was drafting a blog post in my mind, about me lamenting the fact that I may have outgrown Disney theme parks. Perhaps I had long beautified my memories of the previous ones I've visited, remembering only the fun rides and the beautiful sights, but not the long queues that preceded them. Or maybe I was more patient, I remember as a child I didn't mind queuing alone for the Splash Mountains and the Space Mountains in the different Disneylands. Have I lost the patience for all these? A stormy cloud of slight melancholy and gloominess was starting to gather within my mind. You see, I'm not a fan of the heat, and being quite reclusive, I get even MORE reclusive during hot weathers. Last year in summer, I spent some days hanging out in my room, with my curtains closed so I could rid myself of the annoying sunlight. I did the same in Perth, Justin remarked that I was like a vampire. 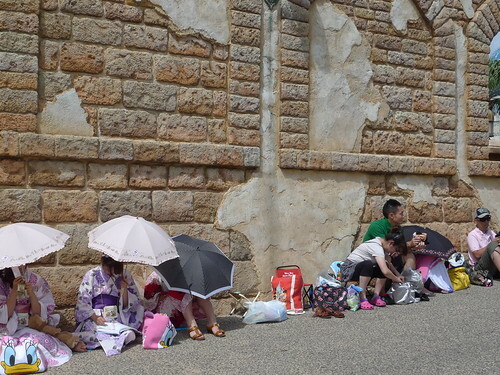 Even the sights of cute girls in Yukata hanging out by the Arabian-themed buildings at the Aladdin-themed Arabian Coast could only lighten my spirits briefly. 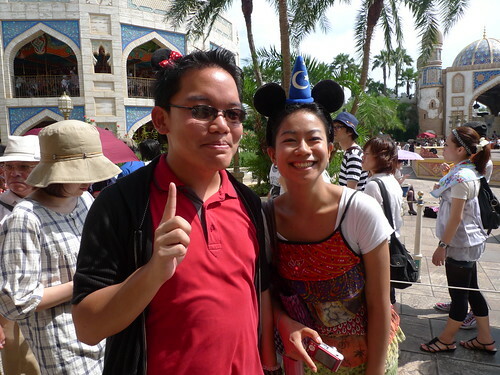 We finally ran into Tou-san when she and her friend were lining up for this 3D show featuring the Genie. She was wearing Mickey Mouse ears, and thought I would look good with Minnie Mouse ears, so she handed me the Minnie Mouse ears she had. I thought I looked pretty transgressive too. But once again, I had some problems trying to keep myself awake during the 3D show. It didn't help that the entire thing was in Japanese. 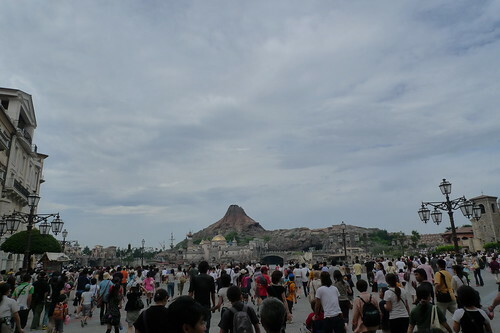 I noticed that most visitors in DisneySea were locals, while there wasn't that many foreign (or non-Japanese speaking) tourists. Most attractions were only in Japanese too. I was a little bummed out that I didn't run into Donald Duck at all. He's my favourite Disney character since I was a child. I empathized with him more compared to the goody-goody Mickey Mouse. Mickey Mouse always seemed to get everything he wanted, while Donald Duck was constantly in trouble. But I bumped into Bob and Helen Parr AKA Mr Incredible and Elastigirl from Pixar's THE INCREDIBLES. And then Daisy Duck again, but this time with Minnie. I was amused by the constant cries of "Daisy-chan!" and "Minnie-chan!". It never occurred to me that this was how the Japanese referred to them. The subsequent rides I took, RAGING SPIRITS and the TOWER OF TERROR were fun enough. Mostly because we had the fun rides and didn't need to queue that long anymore. 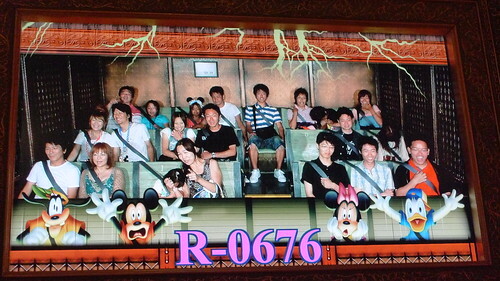 This is the photo from TOWER OF TERROR. I'm at the bottom right. When we saw all these photos on the monitors after the ride, at the counter where these photos were sold, everyone whipped out their digital cameras and cell phones and started snapping photos. I noted with amusement how different things had been compared to my childhood. Now that everyone has a camera and cell phone, they can just take photos much easily, when in the past, everyone had to buy the photos sold by theme park. Of course, there are still some who went to buy the photos, since they came with the nice frames. 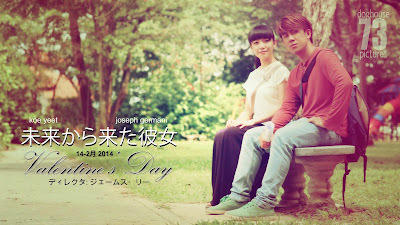 Went the performance was over. The sun was already gone. 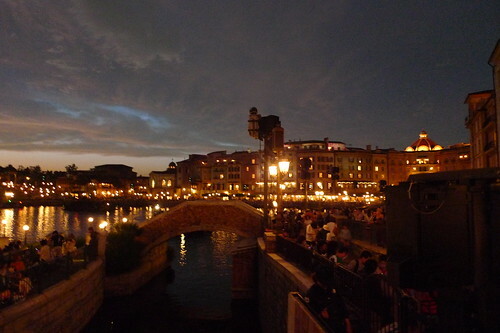 Seeing the place at night, I felt like a child again. It's kinda like Alexander Payne's segment in Paris Je'taime when the plump lady realized that she had fallen in love with the city of Paris during one fleeting, ephemeral moment. But without the tears, of course, since I'm manlier. 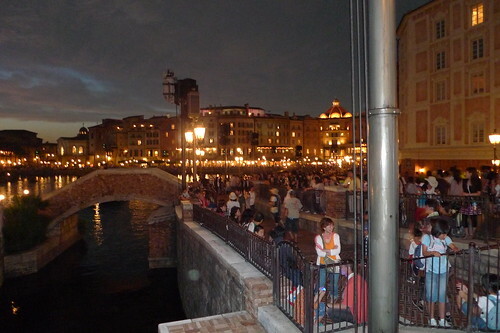 People had already flocked over to wait for the BraviSEAmo performance. 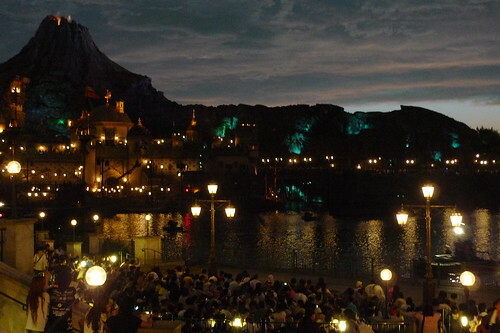 That's their nighttime water and pyrotechnic show. I'm not happy with the video I shot of it, so I'll give you some of the better ones uploaded on Youtube. The last program I went to was the Bon Fire Dance, available only on summer nights. The Bon Fire Dance is actually the Bon Odori. It's fun to see this here, and it's pretty different from the one I saw at the Mitama Festival in Yasukuni Shrine. We left the park as it was closing. By then I had nearly forgotten about the agony I endured, and the dark thoughts I had during the hot afternoon.